Green tea and fish = delish! I dabbled a little in the kitchen tonight. Ben wanted something seafood-y. I obliged. It's quick and easy to cook and generally quite tasty. The only downside is the price of seafood in Australia; but that is a completely different story. Anyway, I thought that I might as well share the little recipe tweak I came up with so that other fish-om-nom lovers can enjoy too. First off, you are going to want to consider the proximity of your smoke detector to your stove-top. If you think that this may be too close, I hope you have the fire department and police on speed-dial so you can continuously inform them about your "faulty" detector. OR!! You can get some rice-bran oil for cooking because is creates less smoke while cooking at high temperatures... I'd choose the latter. 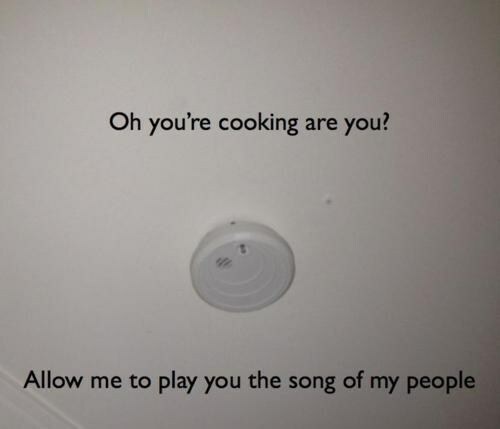 I speak from experience... Our smoke detector enjoys telling my neighbourhood that I am, indeed, cooking with oil. 1. So, add some rice-bran oil into a pan and turn on the heat. Get the oil to cover the base of the pan nicely before you place anything in there. 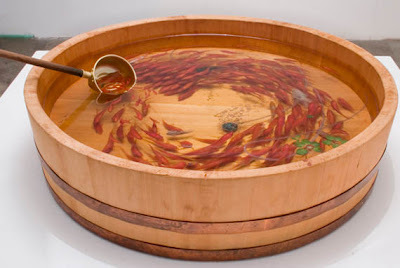 When you tilt the pan to coat the surface, the oil will "run a little like water" - that's when you know its hot enough, that and the ssssSSSSSSSSsssssssssss noise you may start hearing. Add the salmon, skin-side down. Cook on high-medium heat for 1 minute. Turn the heat to medium. 2. 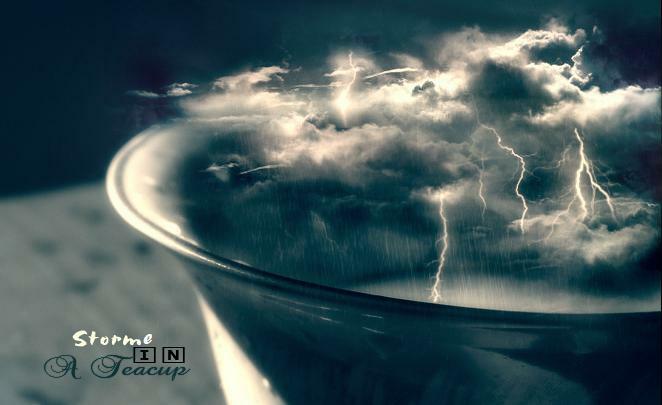 In the meantime, combine the other ingredients into a small pouring jug. Mix well to combine and keep nearby. Turn the salmon over and cook on medium-low heat. 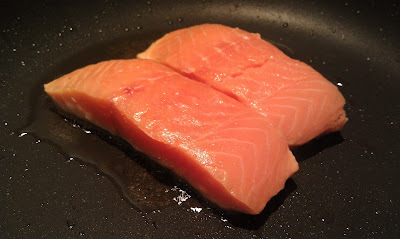 I prefer my salmon to be really pink to near-raw when I cook. If you prefer it well and truly dead, cook for longer than 2 minutes. 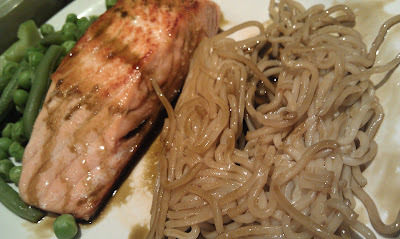 This will all depend on the thickness of the salmon you have but if you get the 160g cutlets then 2 minutes is plenty. Nothing to look at, but it'll taste really good! 3. 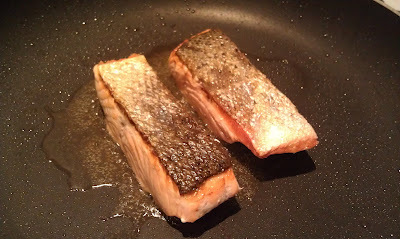 Take salmon off the pan, onto a plate and cover to keep warm. 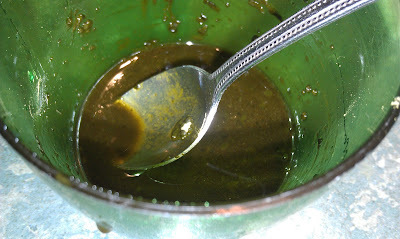 Pour or wipe (carefully) some of the oil out of the pan then add the green tea mixture. It'll bubble and sizzle for a little, keep stirring it and it should thicken just a little. Add your salmon to the pan and coat it in the sauce. Plate up the salmon and pour the remaining green tea sauce over the salmon and any accompaniments you're having with it (I have some cooked ramen noodles and steamed greens). It's messy. I don't care. I'm hungry! Acanthodes bronni. The species name has "bro" in it, and according to a study undertaken by Davis, Finarelli and Coates, the shark-like A. bronni is a member of the family. Wikipedia: Acanthodes bronni; your relative, a "few times" removed. For an understanding of the position human beings find themselves in comparison to A. bronni, have a read of this blogger post: Common ancestor for humans and sharks: Acanthodes bronni. This post provides a brief history of the lineage and traits of Gnathostomes (everything with a spine and jaws). I think I want to turn the swimming pool into a piece of art work. But I won't choose just any old piece of artistry... I want realistic goldfish painted by Riusuke Fukahori. This guy is amazing. I watched all the available footage with his techniques - jaw-dropping. May 13th was Mother's Day this year (well, for Australia that is). I made my mum something in the kitchen this time too - not hippo cookies again ~ she asked me this year to "Please refrain from getting me more hippos; I'm starting to feel like the Crazy Hippo Lady". So, not to worry Mum... I won't give you anything to do with hippos. 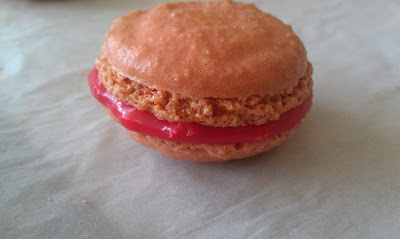 I did, however, make her some strawberry macarons with pomegranate chocolate filling. Anyway, my housemate, Kass, was asked by her folks if she would mind the two cats for them while they moved house and found another place etc. She asked permission from myself and Ben if we'd be comfortable with the living situation - not a problem, we rather like them and had "cat-sat" the youngest for 6-8weeks last year. They arrived VERY SHORTLY (all were given barely 24hrs notice) on Saturday afternoon from QLD. In the meantime, I've made at least 4 batches of macarons; displeased with all of them. Ben needed me to help him pick out a gift for his mum, and then grab some lunch. 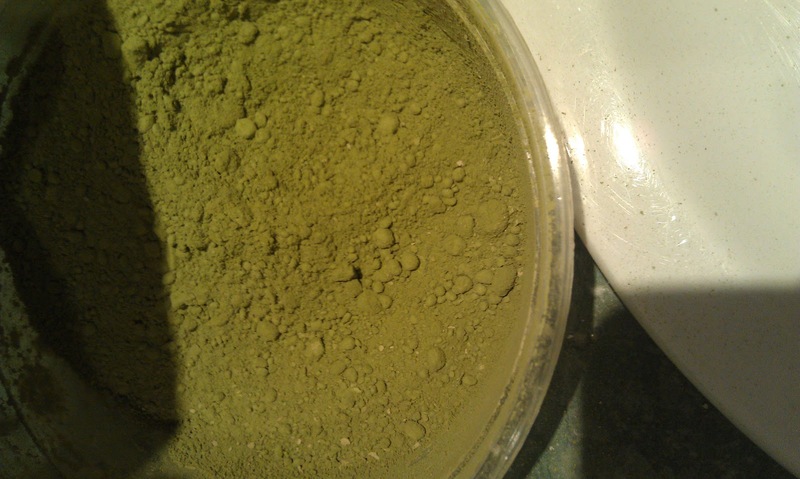 I came back, prepared the 5th batch - hoping against all odds that I get this to my standard! 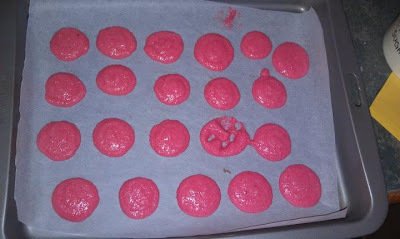 Piped the mixture onto baking paper in 2 trays and set them aside on the kitchen counted to rest for 30mins (macaron thing). Decided to relax before getting ready for Ben's mum's dinner that night, so I stepped out of the kitchen and plonked myself on the couch. Sadly, the three of us were too complacent about the behaviour of the cats. Scamp, the older, chunky grey-and-white feline behemoth, had jumped on the kitchen counter to sniff the window - which had been left a crack open to air-our the kitchen. 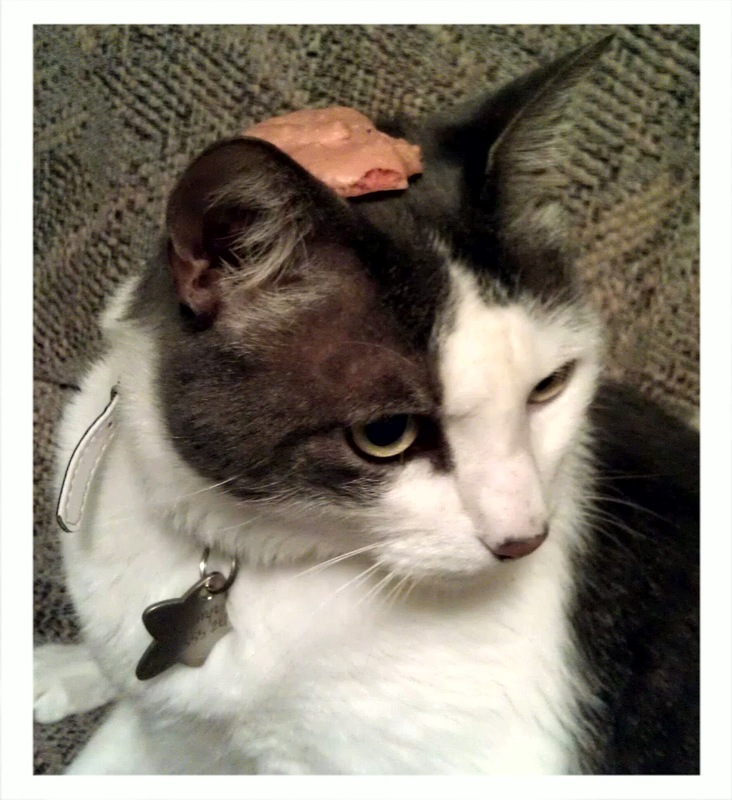 We just heard the bell... turned towards the kitchen and I saw ~with horror~ Scamp straddling the tray; not quite touching the macaron shells, completely oblivious to his own predicament. I called for Ben to hurry up and quickly grab him. Bad move. 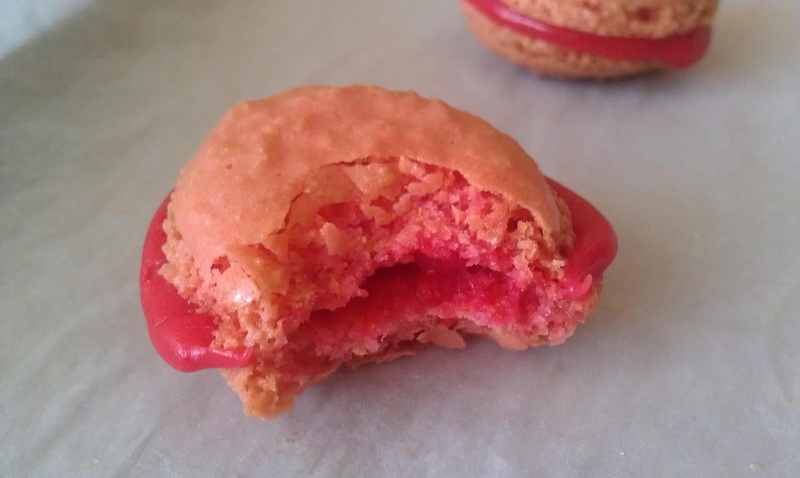 The sudden movements freaked the cat out and he panicked and promptly squelched a big cat paw right in the middle of what was once a perfectly rounded macaron shell. Thanks for the help, Scamp. Much appreciated. I baked them anyway. He had only ruined one. It didn't matter. Besides, it was extremely hilarious seeing a large cat try a short burst of speed with a bright pink, strawberry scented right paw. 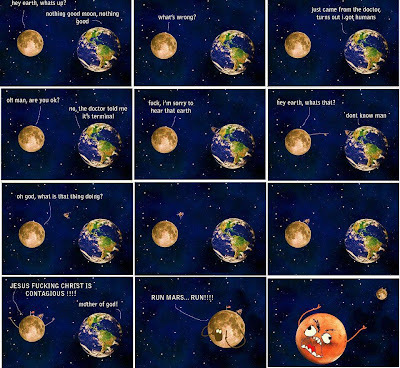 I laughed. Hysterically. 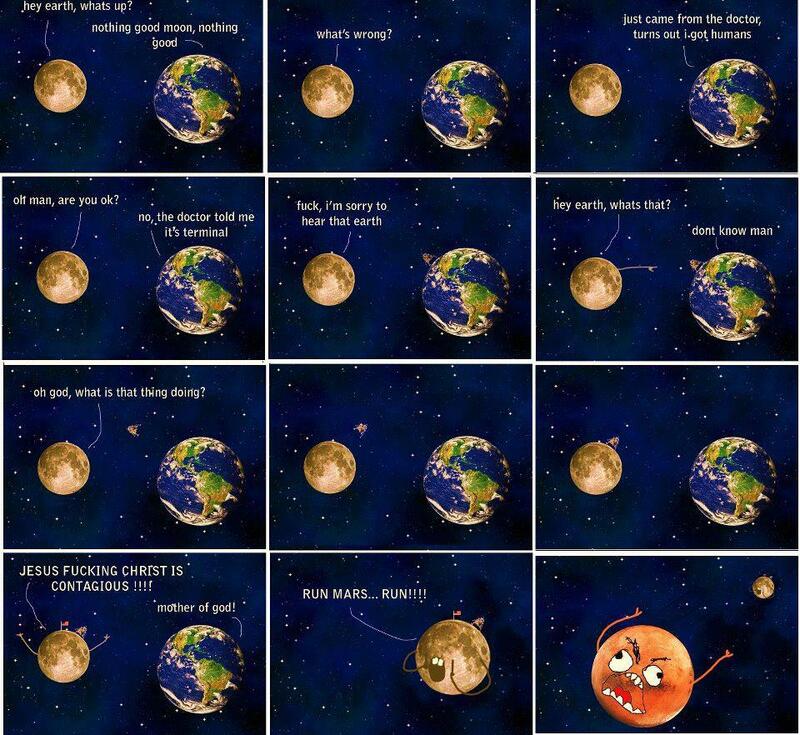 Probably enjoyed this too much, but I had to share. I went under general anaesthetic to extract all four wisdom teeth this past Tuesday. First time under general anaesthetic. Turns out, anaesthetic and I are very good together. I woke up wonderfully albeit a little dazed and sore. The surgeon said it was a routine procedure, but he did note that I had a fairly nasty infected pocket. I didn't feel anything before surgery, so I didn't really think much of it. I'm paying for it now. Fever, chills, pain. Not fun. Thankfully, this whole procedure is a one off. I look forward to eating solid food again *yay*!! Cuddly-looking, fluffy and fuzzy: not something you'd expect to describe a very large carnivorous mesozoic predator. BUT, there WAS a downy dinosaur. Yutyrannus huali, the tyrannosaurid with the fluffy coat, is the largest dinosaur discovered with a full covering of feathers. 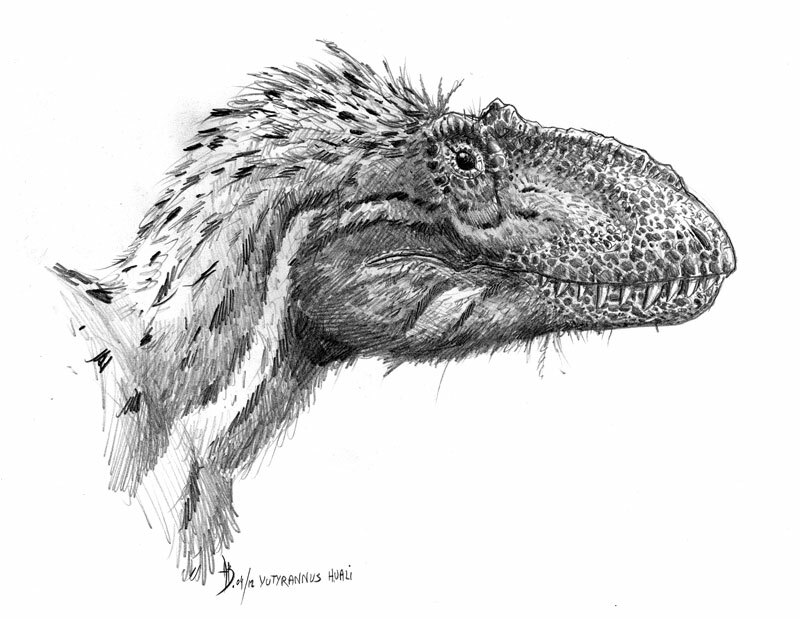 Y. huali was uncovered in China, and estimated to be 60 million years older that its famous cousin, Tyrannosaurus rex. Although considerably feathered, the immense bulk of the predator would not have been very aerodynamic - instead the down was purely for insulation, perhaps with a little splash of colour for display. It's not entirely odd for a predator to be feathered - snowy owls manage quite well in polar climates and their physiology is simply a downsized version of Yutyrannus. Info collected from these news articles here, here and here. And this journal article in Nature.